If there’s one thing this baby’s got me craving constantly, it’s fruit, fruit and more fruit. Fresh berries, juicy citrus and gorgeous green kiwi are my addiction… and I don’t wanna quit. They tried to make me go to raspberry rehab, and I said noooooo no no. So, what better way to get my fruity fill and celebrate St. Patrick’s Day than with a little edible rainbow? 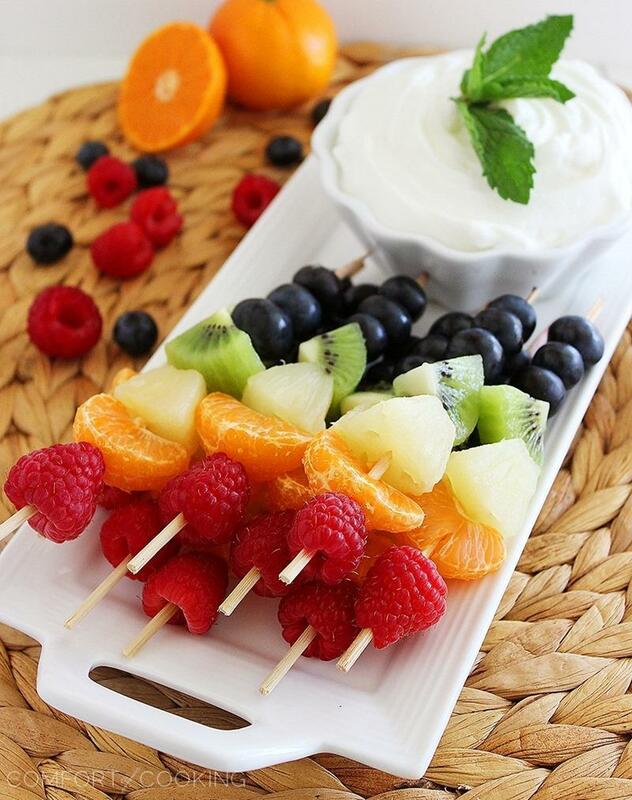 Paired with a creamy honey-vanilla yogurt dip, these fruit skewers are a scrumptious, healthy snack… and super easy, too! For a little spice, swirl a half teaspoon of cinnamon into the dip. Need a little color on top? Garnish with mint leaves or a few extra berries. 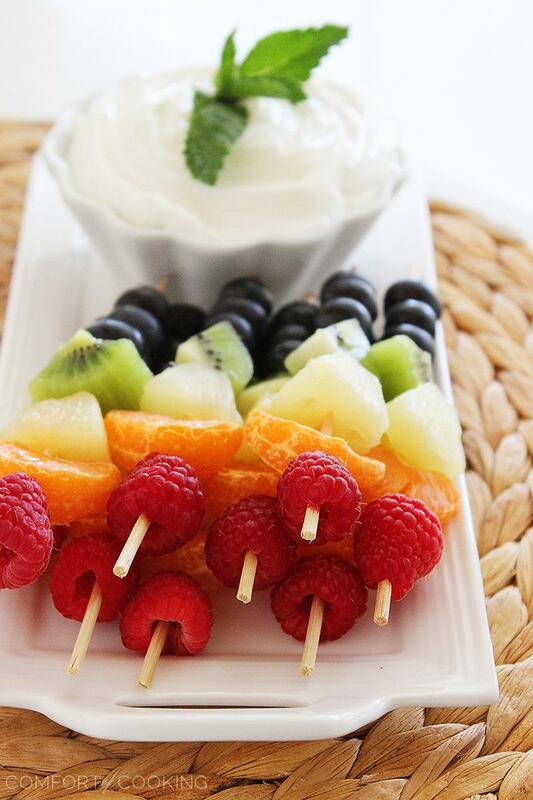 For the skewers, just pile on your favorite fruits! Anything that you like, or that’s in season, is a good bet. Instead of raspberries, try strawberries. Swap the orange with cut-up cantaloupe, or the kiwi for green grapes. Feel free to get creative! For birthdays, showers, and any spring or summer event, these rainbow fruit skewers are the perfect party snack! They’re fresh and light, easy to make last-minute, and adorably colorful. You can also use the dip on cut-up apples, bananas and strawberries! If you’d like it a little sweeter, add a bit of brown sugar. Want a more savory dip for a veggie platter? Toss the yogurt with a packet of Ranch seasoning or your favorite hot sauce. In a medium bowl, stir together yogurt, honey and cinnamon. 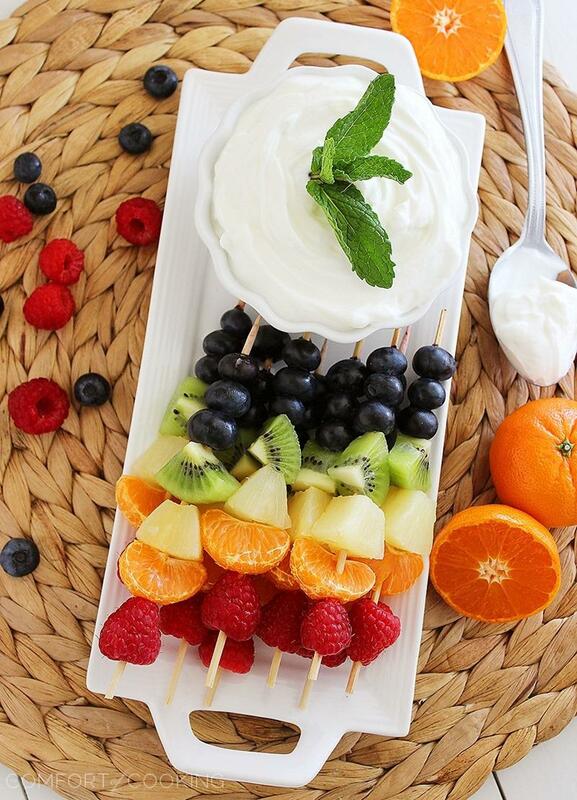 Thread fruit onto skewers and serve with yogurt dip. I used raspberries, oranges, pineapple, kiwi and blueberries. Feel free to get creative and use what you like, or what’s in season! What gorgeous fruit! I can taste the rainbow! I love making treats like this for showers. So cute, Georgia! I love snacks like this Georgia — they make you feel good inside because they’re so healthy, and they’re also so colorful and pretty! These are so gorgeous! I have been looking for cute ideas for my bridal shower. This is spot on! So refreshing and pretty too. I love fruit and yogurt. Great idea. These look so beautiful and refreshing – I could really go for one right now! Yum!! Perfect breakfast or anytime treat! Gorgeous display Georgia – I’d love a platter of this ready in my fridge! Fresh fruit is so good for you and baby! Not to mention beautiful too! I used to make a whole mess of these for boys’ swim meets. They are so pretty that the kids always grabbed for them before the less healthy choices. LOVE the yogurt based dip. Yum! OMG how absolutely adorable are these! I am definitely pinning this for later-it would be perfect for a Rainbow party! What a great brunch idea! beautiful! Perfect! I love fruit snacks like this, Georgia. 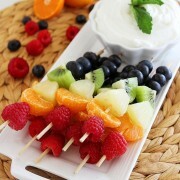 So pretty on skewers and I love that honey-vanilla yogurt dip! Must make this soon. Lovely photography, my friend. :) Thanks for sharing! Beautiful skewers, so perfect for spring! These would make such a great after dinner or lunchtime snack. They’re gorgeous! so easy but so creative and delicious. I love recipes like that! Job well done! I totally craved fruit during my pregnancy! These are beautiful. Such a pretty way to eat your fruit! Made this dip this weekend for a party, it was AMAZING. Very efficiently written information. It will be supportive to anyone who employess it, including me. Keep doing what you are doing – for sure i will check out more posts.